The Chicago members of The PEER 150 are honored to host an evening of networking and content at University Club of Chicago. Attendance is open to senior human resources executives approved by our PEER 150 team. We look forward to seeing you on Tuesday, March 13th! The global market for talent is the most competitive it has been in well over 50 years. It is clearly a candidate driven market and is predicted to be so until at least 2050. So how can you compete for great talent and create “stickiness” through building a compelling culture? In this session, we will look at the current trends in HCM that are driving the market. This includes what innovative ideas organizations are exploring to reach out to talent and create cultures where people join and want to stay. From reaching out to new college hires to increasing engagement in a way that really has a sustainable impact on development and business performance, there are exciting practices emerging that can help you win in today’s competitive talent market. Pamela Stroko is Vice-President HCM Transformation and Thought Leadership at Oracle Corporation and a recognized leader in HCM and talent management with over 20 years’ experience as a practitioner. She is an author, keynote speaker, seminar leader, executive coach, and consultant working with Oracle’s customers in the HCM space. Over her career she has developed deep expertise in all aspects of talent management, focusing on delivering business results by aligning enterprise strategy with strategies for building people capability across the organization. 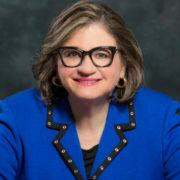 As a recognized thought leader, Pamela is frequently a keynote speaker and workshop leader at the industry’s largest forums: SHRM (Internationational and Regional events), HCI, Argyle, Evanta, TMA, HRMA, Oracle HCM World, Oracle Open World, Gulf Coast Human Resource Symposium as well as numerous regional professional groups and Human Resource forums. Pamela has authored white papers, workbooks, and research reports. Her e-book series: The Chemistry of High Performance, which is a 7-part series, launched in June 2016. At Oracle, Pamela works with customers to develop their HCM strategies and implement end to end core HR and Talent solutions. Customers engage Pamela to develop solutions in talent attraction and retention, performance management, talent review and succession, career management, culture and engagement, leadership and employee development, and business case development for HCM innovation. Pamela developed her expertise as a talent leader by serving in senior business and HR roles at RR Donnelley & Sons Company, Deloitte, The Coca Cola Company, ICI London, and Gap Inc.
Lapin International is a US-based strategy-consulting and leadership development firm, specializing in transforming organizations and leaders through the integration of strategy, leadership, and structure. We partner with HR leaders to build sharply focused, purpose-driven organizations led by aligned, inspired and values-centered leaders, that deliver sustainable growth and big impact in industries they serve.